archaic) and, the STROG (Strait Of Gibraltar) in naval use. ● Europe and Africa are separated by 7.7 nautical miles (14.3 km) of ocean at the strait's narrowest point. The Strait's depth ranges between 300 and 900 metres ( 980 and 2,950 ft) and If we are going in past 20, 000 years ago, there was lower mean of sea level , it is believed to have been lower by 110-120 m ( 360-390 ft). In order to compare there is huge differences in sea level. Ferries cross between the two continents every day in as little as 35 minutes. The Spanish side of the Strait is protected under El Estrecho Natural Park. ● As the Location it has divided in two parts Northern side and Southern side. On the northern side of the Strait are Spain and Gibraltar (a British overseas territory in the Iberian Peninsula), while on the southern side are Morocco and Ceuta (a Spanish exclave in Morocco). Its boundaries were known in antiquity as the Pillars of Hercules. ● Due to its location, the Strait is commonly used for illegal immigration from Africa to Europe. hundreds of thousands of seabirds use it every year to pass between the Mediterranean and the Atlantic, including large numbers of Cory's and Balearic shearwaters, Audouin's, yellow-legged and lesser black-backed gulls, razorbills and Atlantic puffins. ● The seabed of the Strait is composed of synorogenic Betic Rif clayey flysch covered by Pliocene and/or Quaternary calcareous sediments, sourced from thriving cold water coral communities. Exposed bedrock surfaces, coarse sediments and local sand dunes attest to the strong bottom current conditions at the present time. ● Around 5.9 million years ago, the connection between the Mediterranean Sea and the Atlantic Ocean along the Betic and Rifan Corridor was progressively restricted until its total closure, effectively causing the salinity of the Mediterranean to rise periodically within the gypsum and salt deposition range, during what is known as the Messinian salinity crisis. In this water chemistry environment, dissolved mineral concentrations, temperature and stilled water currents combined and occurred regularly to precipitate many mineral salts in layers on the seabed. The resultant accumulation of various huge salt and mineral deposits about the Mediterranean basin are directly linked to this era. It is believed that this process took a short time, by geological standards, lasting between 500,000 and 600,000 years. ● It is estimated that, were the straits closed even at today's higher sea level, most water in the Mediterranean basin would evaporate within only a thousand years, as it is believed to have done then, and such an event would lay down mineral deposits like the salt deposits now found under the sea floor all over the Mediterranean. 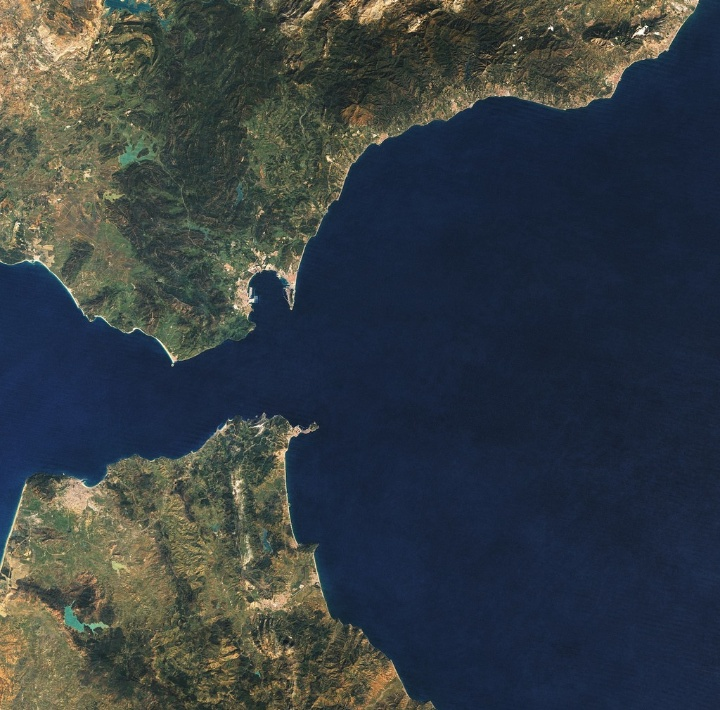 ● After a lengthy period of restricted intermittent or no water exchange between the Atlantic Ocean and Mediterranean basin, approximately 5.33 million years ago, the Atlantic-Mediterranean connection was completely reestablished through the Strait of Gibraltar by the Zanclean flood, and has remained open ever since. The erosion produced by the incoming waters seems to be the main cause for the present depth of the strait (900 m at the narrows, 280 m at the Camarinal Sill). The strait is expected to close again as the African Plate moves northward relative to the Eurasian Plate, but on geological rather than human timescales. ● Evidence of the first human habitation of the area by Neanderthals are dates back to 125,000 years ago. It is believed that the Rock of Gibraltar have been one of the last outposts of Neanderthal habitats in the world, with evidence their presence there dating to as recently as 24,000 years ago. ● Archaeological evidence of Homo sapiens habitation of the area dates back c. 40,000 years. ● Beginning in 1492, the straits began to play a certain cultural roles in acting as a barrier against the cross-strait conquests and the flow of culture and language that would naturally follow such a conquest. ● In year 1492, the last Muslim government of north of the straits was overthrown by a Spanish force. Since that, the straits have come to foster the development of two very distinct and varied cultures on either side of the straits after sharing much the same culture and greater degrees of tolerance for over 300+ years from the 8th century to the 13th century. ● On the northern side, Christian-European culture has remained dominant since expulsion of the last Muslim kingdom in 1492, along with the Romance Spanish language, while on the southern side, Muslim-Arabic/Mediterranean has been dominant since the spread of Islam in North Africa in the 7th century, along with the Arabic language. For the last 500 years, religious and cultural intolerance, more than small travel barrier that the straits present, has come to act as a powerful enforcing agent of the cultural separation that exists between these two groups. ● The British enclave of the city of Gibraltar presents a third cultural group found in the straits. ● This British enclaves was first established in 1704 and has since been used by Britain to act as surety for control of the sea lanes in and out of the Mediterranean.